My new book, “Tornado Alley”, is here! 名古屋市昭和区の英会話スクールBigBowEnglishLab > ブログ > My new book, “Tornado Alley”, is here! 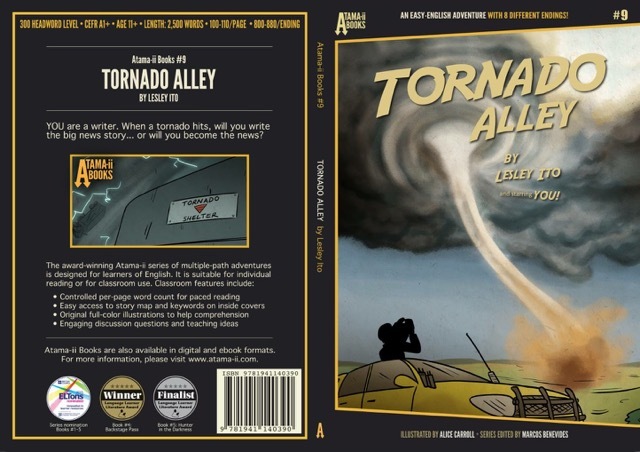 My latest book for the Atama-ii Books series, Tornado Alley, was released one week ago! Tornadoes were something that always scared and fascinated me as a child because we had them from time to time where I grew up in central Florida. I have a vivid memory of being in the second grade when the electricity went off at school during a tornado warning. Once a tornado ripped the roof off a high school in my county and another time, a small tornado in my neighborhood threw a trampoline over three houses onto my neighbor’s roof! When I started writing my second book for the Atama-ii Books series, I had just finished teaching some lessons on tornadoes. I read news stories about a recent deadly tornado in Missouri, read survivor stories, and watched “storm chaser” videos on You Tube because I wanted to make this story as authentic as possible. I hope you and your students enjoy reading it as much as I enjoyed writing it!